I interned at a division of Pfizer (the pharmaceutical company...you know the good people who brought you Viagra and Lipitor) the summer before my senior year of college. I was trapped at a desk and basically snacked my way through that internship. Lots of almonds, apples, yogurt, and the occasional soft baked cookie from the cafeteria were consumed. Not much has changed. Now that it's spring my snacking tendencies will soon be geared toward strawberries...lots of them. But for the next two weeks it'll be asparagus pickles. 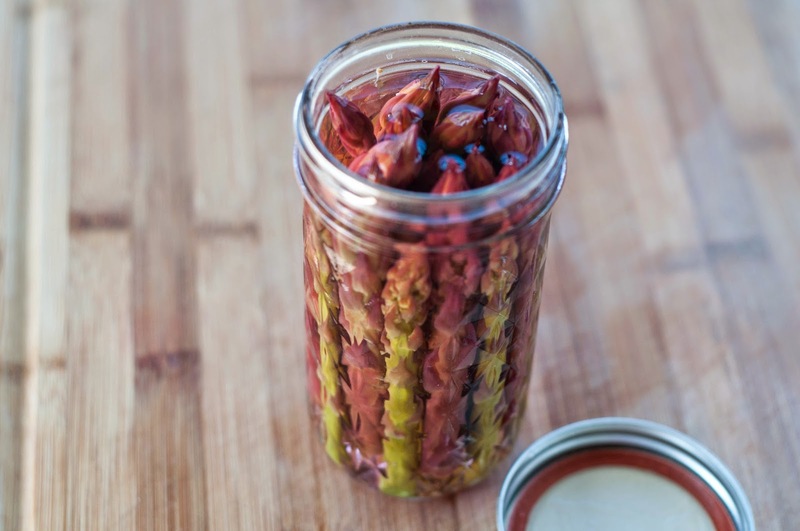 Tangy, easy, a little crunch....and very much so spring in a jar. 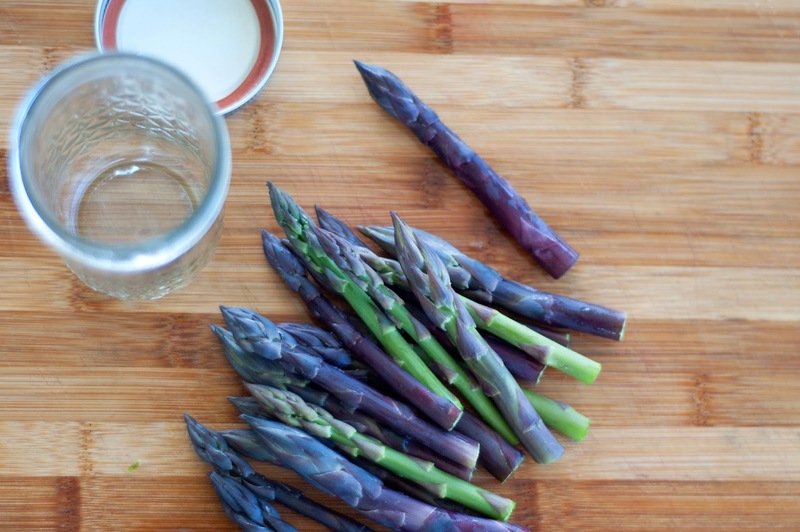 The trick to getting great picked asparagus is to do a quick blanch first to allow the stalks to take up the vinegar and become pickled. Put some water in a saute pan and bring it to a boil. Place washed and cut asparagus into boiling water for 1 minute. Remove, let cool a little and place in your jar standing tall. In a pot combine vinegar, water, salt, mustard, and dill weed. Pour hot liquid over asparagus and apply lid. Put in the fridge for a least 24 hours before snacking. That purple asparagus is beautiful! Nice idea of taking pic with the green to show contrast in color. I got some purple passion asparagus roots this year to pant, maybe next year i'll be able to munch a few. Fresh asparagus sure is worth the wait in growing it up a couple of years!!! What's your fav strawberry variety for production Rose??!! The purple asparagus is my favorite for sure! And I totally agree with worth waiting two or three years for a good crop. As far as strawberries go...at this time we don't grow them so I really don't have a good answer for you. They are an expensive thing to produce and as much as I want to I'm not sure it'll happen this fall. However I have until June to make my decision. So stay tuned for an answer on the strawberry variety.